To most modern Americans, the hammered dulcimer is a new and unfamiliar instrument. Even people who know much about American music often confuse the hammered dulcimer with the three- or four-stringed “mountain” or “plucked” dulcimer, although the two have nothing in common except their name. Surprisingly, the hammered dulcimer, which is an ancient ancestor of the piano, at one time enjoyed widespread popularity throughout this country. Throughout the late Middle Ages and the Renaissance, the dulcimer remained a popular instrument in both eastern and western Europe. It was known by different names in different countries. For example, the dulcimer was called a “tympanon” in France, a “hackbrett” in Germany, and a “cymbalon” in Hungary. In England it was so popular during the late 16th century that the translators of the King James version of the Bible used the term “dulcimer” as the English translation for the Greek “symphonia.” This term was actually a mistranslation for a type of Greek bagpipe that gave rise to the often quoted, but incorrect, belief that the dulcimer is as old as the Bible. It is unclear when the first hammered dulcimer was brought to America, but the earliest reference to its use in this country comes from Judge Samuel Sewall who wrote of seeing one played in Salem, Massachusetts, in 1717. 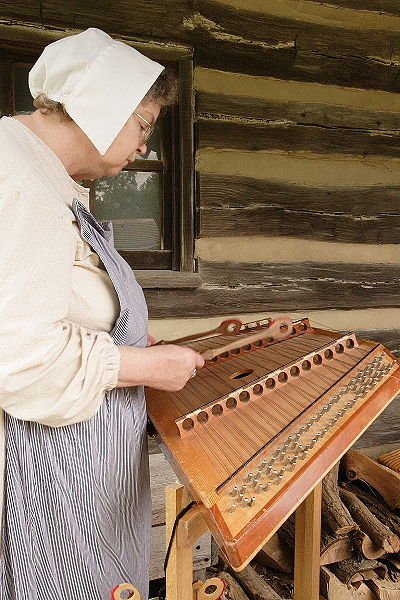 Hammered dulcimers are particularly interesting because, unlike the piano, dulcimers were often built at home, or in small shops and factories, and hence tended to reflect differing regional and personal folk styles. During the 19th century, these small shops, which usually employed less than a half-dozen craftsmen, operated in places like Norwich, Connecticut, Chautauqua County, New York, and Brooklyn, New York. Mail order companies (e.g., Montgomery Ward) also sold dulcimers. Why the dulcimer virtually disappeared during the first half of the 20th century is something of a mystery, but possibly it was due to competition from the more fashionable piano. Fortunately, this beautiful instrument is now enjoying a revival. For the first time in many years, new dulcimers are being built, and there is an increasing number of new players. This entry was posted on Thursday, December 12th, 2013 at 09:23	and tagged with cytopicus, Dulcimer, ram51, The Hammered Dulcimer and posted in The Folk Music of The United States. You can follow any responses to this entry through the RSS 2.0 feed.